We have had a busy month reviewing shows for What's Good to Do and have seen a variety of different shows. We started the month with The Glenn Miller Story which was a great show, our review is below. 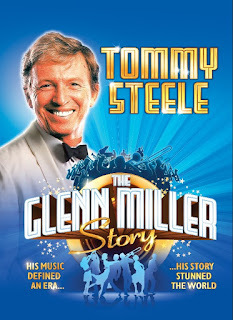 My Grandma was a big fan of both Glenn Miller and Tommy Steele so I was looking forward to seeing this new show. We were certainly amongst the youngest members of the audience but with the main star being 78 this was perhaps to be expected! Tommy, playing Glenn also narrates the story, he starts the show with an American accent however his cheeky cockney accent made several reappearances throughout the show! His voice is still very powerful and whilst he didn’t join the younger members of the cast in the dance routines he moved about the stage like somebody 20 years his junior. The show opens with a short introduction by Tommy and is set just before Glenn takes his last flight. We are then taken back in time to Glenn’s earlier years as a struggling musician and his first meeting with Helen, played by Sarah Soetaert. Sarah was obviously a lot younger than Tommy and it did look a little odd, especially in the more tender scenes. The first half is quite slow paced and includes a good number of songs sung by Tommy with plenty of dancing by the much younger chorus. Once Glenn’s band had been formed the second half of the show picked up pace and the 16 piece orchestra took to the stage. We were treated to a powerful performance by talented musicians who played many of Glenn’s memorable hits as the story moved to the later war years and Glenn’s time as a Major in the army. The ending of the musical, and Glenn’s disappearance over the English Channel was dealt with movingly and the band's last number was Pennsylvania 6-5000, a theme that had repeated throughout the night. Following a standing ovation, the cast returned to the stage for an encore with a medley of hits that the audience joined in with. It is difficult to pick out one particular person as a highlight of the show, Tommy brought a great feeling of fun, Sarah, as Helen was perfectly cast and all the singers, dancers and musicians were faultless in their performance. It was a reasonably short play, we were leaving the theatre just after 9.30 and had we not needed to get back it would have been nice to sample some of Manchester city’s nightlife. The Palace theatre is in the middle of Manchester and for those driving into the city there are plenty of car parks in the area. We parked in the adjacent NCP car park which has an evening rate of £6. One word of advice, those with larger cars might struggle in some of the rather snug parking bays. I wouldn’t say we are into 40’s music but we really enjoyed the musical as it is such a treat to hear a big band playing live and it was obvious that the rest of the audience enjoyed it too.